Asylum is an uncharted shadowport in Wild Space and a haven for those fleeing Arcann's control. Although out of the Eternal Throne's reach, refugees don't find Asylum an easy place to live. Because its location is unknown to the Eternal Empire, smugglers, pirates, and gangs use Asylum as a base of operations. Rival syndicates wage war in the Free Zone, a black market for goods from all over the galaxy. Street fights are common, and the desperate are easy targets for the port's large criminal element. Looming over Asylum is the Control Spar: the remnants of a long-abandoned mining operation that now acts as the main control center for the port's security defenses and docking management. In the ancient days of Zakuul, the Endless Swamps were a harsh home filled with countless dangers. If the deadly predators didn't take the Old Zakuulans, perilous sinkholes and disease-ridden pests would. Political refugees fleeing Arcann's wrath have often used the swamps for shelter, but the region's population exploded after Asylum's destruction. Zakuulans who oppose the new Emperor are forced to hide in the treacherous lands of their ancestors, fighting for their lives in a murky, deadly world far from the Spire's glamour. The more superstitious exiles claim to feel the eyes of the old gods watching them from deep within the bog. In reality, these eyes likely belong to the native beasts waiting for their opportunity to strike. The Eternal Throne sits at the top of a starscraper in the center of the Spire. Built by Valkorion over a century ago, the throne not only serves as the Immortal Emperor's seat of power, but is the key to activating and controlling the Eternal Fleet. 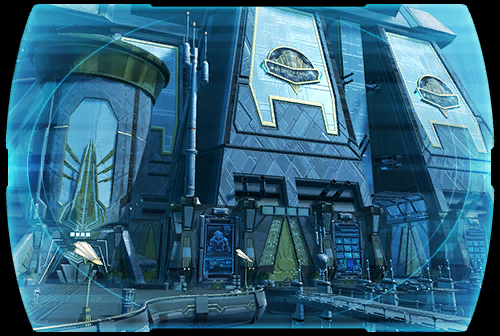 Valkorion gathered the greatest minds in Zakuul for its construction, which took generations to complete. How and why the fleet responds only to the throne remains a mystery even to the Zakuulan people--only Valkorion and his children know the true answer. Zakuulans have always been fascinated by suffering. In ancient times, the Old Ways taught that pain represented the power of the gods. Now, living in a near-utopia, most Zakuulans have never known what it means to suffer. Food, shelter, clothing and education are all provided by the grace of the Emperor. But in the lower recesses of the Spire, called the Old World, citizens can leave their pampered lifestyles behind and pay for the pretense of suffering, placing bets on gladiators in the arena or living out dark fantasies in the red-light district. The Knights of Zakuul have no jurisdiction there, which Arcann allows only because it keeps the privileged docile and content. Located below the Old World is Breaktown, an urban wasteland where an underbelly of outcasts has fled from the Eternal Throne's authority. In this forgotten city's decrepit ruins, debtors, black-market criminals, and those who reject the Emperor set up new pockets of society away from Arcann's prying eyes. To maintain citizen equality, nearly all menial labor is handled by a droid workforce. Zakuulans rely on it for medical care, construction, law enforcement, and more. Droids provide elderly companionship and safe childcare, and they cook, clean, run errands, and keep the Spire in order. Without droids, the city's comfort and happiness would vanish. Overwatch is the hub through which all droid labor functions. This command center issues orders to its workers and keeps every droid running smoothly. To reduce human error as much as possible, only those with highest clearance, including the Emperor, are permitted to enter. Automated life-form detection and a patrol of Skytroopers ensure that no one without permission can enter. Built on the swamps of Ancient Zakuul, the Spire symbolizes the golden age Valkorion created for his subjects. The towering metropolis comprises vertically stacked and numbered districts, each of which boasts a labyrinth of museums, restaurants, and entertainment designed for maximum enjoyment. The highest level, District 52, houses the droid command center Overwatch and the opulent Eternal Throne. Below District 1 is Oldtown, which serves as a dark playground where citizens can explore their more unsightly appetites in privacy and safety. Most Spire denizens have visited Oldtown, but few will admit it. Though Zakuulan society is deliberately classless, many Spire residents use the districts as a status symbol. Those living on levels near the Eternal Throne may boast of a superior "closeness" to the Emperor while districts near Oldtown are considered the slums. In reality, every district is carefully constructed for identical living conditions, just as the Emperor intended.